A woman with flipped forelock of hair, Mine Okubo, looks at large crowd gathered in laundry building converted into a bull pen on September 16th prior to leaving for the Central Utah Relocation Project, also known as Topaz, from Tanforan Assembly Center, California during World War II. In bottom right corner foreground, Mine and her brother, Benji, appear in profile. 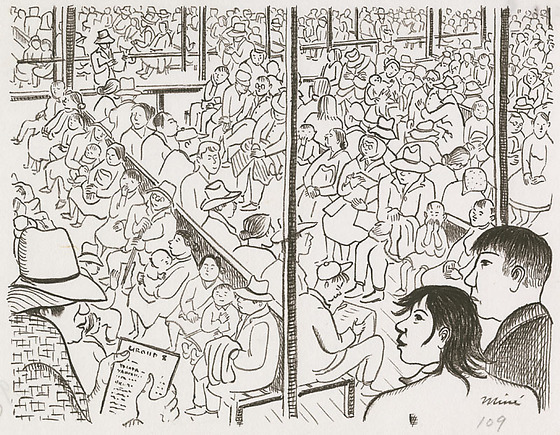 The head and shoulder of another man in a hat appears in opposite corner, left, holding a list, "Group 8." Men, women and children sit on rows of long wooden benches, filling the space. Signed at bottom right corner: Mine. Written in pencil, bottom right corner: 109. Written and circled in pencil, bottom left corner: 109. Stamped in black ink on back, top left corner: 5191. Written in pencil on back, bottom right corner: 109. Drawings for the book, Citizen 13660, began as sketches and drawings created by Okubo while incarcerated at Tanforan and Topaz to tell faithful friends about camp life and were intended for exhibition purposes. Drawing is on page 114 of book.